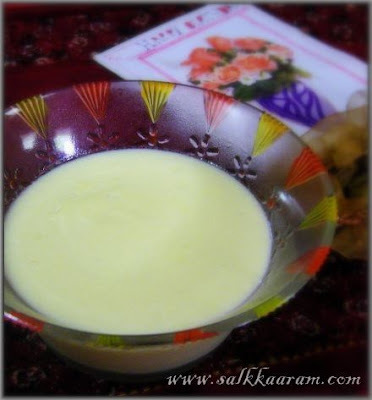 Homemade Custard | Simple and Delicious ! Mom reminded me there are two packs of ready made custard powder stored in the refrigerator, when I told her am going to make some custard. I told I have prepared custard before, using the ingredients available in the kitchen, then no need to depend ready made one when we are not busy. I used some cornflour as a thickening agent, you can use flour or gelatin instead. 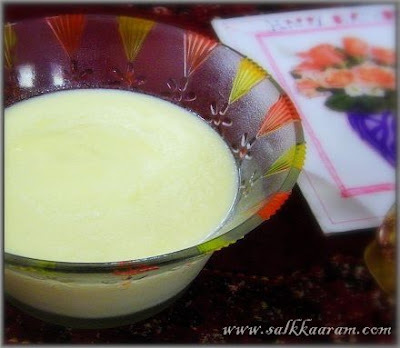 The color and thickness of the dessert may vary according to the number of egg yolks and the amount of the thickener used. Beat egg yolks, sugar and cornflour in a bowl until creamy. Warm milk and add this. Add butter , vanilla essence and cook stirring continuously and the custard thickens and coats the back of the spoon. Thanks for the recipe, I tried it out and its perfect! I am going to have it with some fresh fruits and caramel sauce :)!